Cathy graduated from Springfield College in 1994 with a Master’s Degree in Physical Therapy. 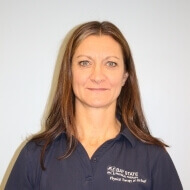 In August of 2001, Cathy became a McKenzie Certified Therapist by completing her certification in Mechanical Diagnosis and Therapy of the Spine in Ottowa, Canada. Other clinic interests include treatment of postoperative patients and management of overuse injuries in active patients of all ages. In her free time, Cathy enjoys running and spending time with her family.